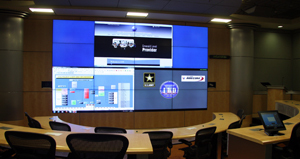 When the I2WD division of the US ARMY, along with their consulting group JSC, LLC Consultants, decided to seek out a premier Audio Visual Integrator for the room Design Peer Review, Engineering and Installation of their new IESIL Lab, AVS Installation was their vendor of choice. Located in the SCIF at Aberdeen Proving Grounds, MD, the new lab boasts state of the art technology that allows for the connection of all secure and non-secure computer sources to be connected, presented and shared across continents if this is so desired. The lab features a very large high resolution (1080P) Video Wall comprised of (16) Planar ultra-thin bezel 55” displays. Wall processing allows for a whopping (32) DVI/RGB inputs, (32) VNC inputs and (32) DVI/RGB outputs. 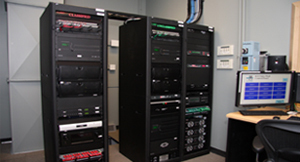 All Source switching is accomplished via multiple Creston Digital Media routers. All control commands are made via the Crestron control unit by utilizing any one of the (3) LCD control panels. Even an untrained guest can make complex commands through the easy to use graphical user interface provided. The Control room houses multiple equipment racks along with an operator’s station that feature’s a large touchscreen display that allows an operator to choose video wall layouts, control all audio levels as well as lighting levels and all other environmental control. The state of the art room is outfitted with high-end custom millwork, multi-tiered seating, gallery seating and has been acoustically treated and designed for optimal sonically pleasing performance. This space has also been accredited for top-level TSI classified briefings.